I have on many occasions happened upon sites that seem to have their own, shall we say, ‘ anima loci’ and associated energy. It is reputed that Nature Spirits too have a different, subtle but intense energy. It is then not particularly surprising that energetically sensitive individuals ( e.g. empaths) are more prone to sensing their presence. There were many there, just out of sight, obscured from my vision by their different vibration. They were able to manifest if they so desired, enabled even more so due to the liminal and numinous nature of the site. A canopy of leaves from the large cluster of fir trees prevented the daylight from revealing much of the ruinous stone circle and its environs. This added further more to the air of mystery and secrecy around me. Any ceremonial or magical activity was securely cloistered from the outside world by the tight knit plantation of trees and dense undergrowth surrounding the stones that remained. I sensed many ethereal eyes watching me from under the cover of the bushes, trees and foliage as I sat on a nearby log. The air around me felt heavy with anticipation as if I had in some way interrupted some sacred liturgy. The moist sandstone hewn stones covered in moss and lichen appeared to subtly emanate a low green phosphoresence again adding to the apparent preternaturalness of the occasion. The overhanging branches of the trees met the verdant amorphous scrub rising up from bog strewn soil as if to encapsulate all within in a further act of concealment. A small winged creature skittered across the pond a little off to my left in my peripheral vision. I was uncertain as to what creature it may have been but its action was determinedly avoidant. The slim lower branches of the trees were entwined with gorse, holly and ferns forming an almost impenetrable mesh in the undergrowth around the stones themselves. I swear that I could see hundreds of small faces in amongst the leaves, some wizened and grotesque whilst some appeared young and vibrant. Feeling distinctly awkward, a little anxious and somewhat unnerved I stood up to leave by the way I came. 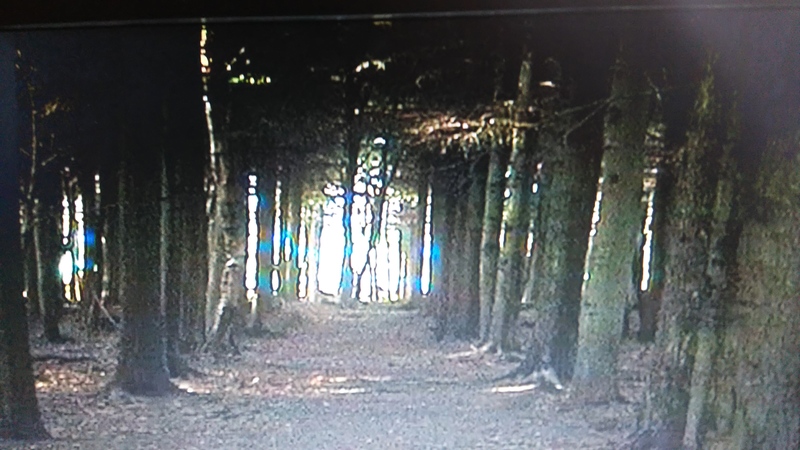 The pathway between the trees was up ahead, strange fluorescent blue lights seemed to be emanating from behind them as if each one were hiding a wisp like spirit within their trunks. They lined either side of the track like surreptitious phantoms silently awaiting the arrival ( or departure) of a very important guest. Thankfully as I walked towards them their cerulean glow seemed to dissipate the closer I become. Still having the sensation on the back of my shoulders and head of watchful eyes burning into them, I briskly left the grove into a comparatively sunnier and thus lighter atmosphere of a nearby glade. Whatsoever esoteric event was taking place that afternoon I would never know and perhaps it’s best that way. Some things are best hidden from the tender eyes and minds of mortals. How mysterious and wonderful.. i wonder how much of what goes around us we as humans cannot grasp..